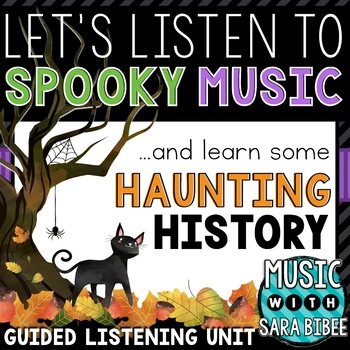 This activity is great for the days leading up to Halloween or anytime you want to discuss the power of music over frightening moods! Check out the preview file to see all presentation slides and follow-along worksheet options! Please note that the preview might be grainy due to file constraints. Once downloaded, the presentation is in a crisp, HD quality. This is a zip file containing a PDF and PPT presentation for 18 musical composers/performers consisting of 21 musical selections spanning the baroque to contemporary musical periods. 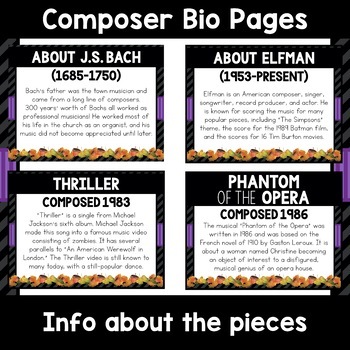 For each composer, you will find a biography of the composer, information about the piece(s) he/she created, and links to YouTube videos (SafeShareTV Links) of examples of the songs. Don’t worry, this should be fine for even the younger kids (but not too young!). I recommend this activity for grades 2 and up, even high school students. Be aware that this product is for all grades. What is appropriate for some grades may not be for others. I highly recommend that you screen the videos prior to showing in class. There are a few videos that may not be suitable for younger children. This is also why there have been several video options given for certain pieces. EDITED 10/11/15: Fixed broken links that were caused from YouTube changes to videos and accounts. COMPLETE OVERHAUL to new design. 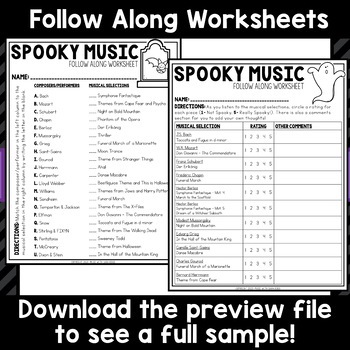 New worksheets added. Three new pieces added (In the Hall of the Mountain King, This is Halloween, Aha!) More video options added. PDF version added. EDITED 10/19/14: Fixed links that were routed to videos that were removed since the creation of the product. Also changed the links from YouTube to SafeShareTV. EDITED 10/23/17: Links checked, Halloween Main Theme fixed. EDITED 10/1/18: Links checked, Several links updated to have newer, better quality videos. 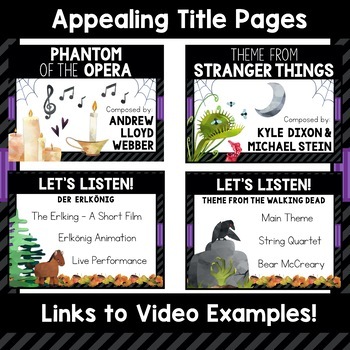 One link had been broken completely (Phantom of the Opera). Pentatonix bio updated to not include the names of the old members.